President Donald Trump speaks during an event at the White House in Washington, as first lady Melania Trump listens. They traveled to New Hampshire Monday to discuss, among other things, the nation's opioid epidemic. 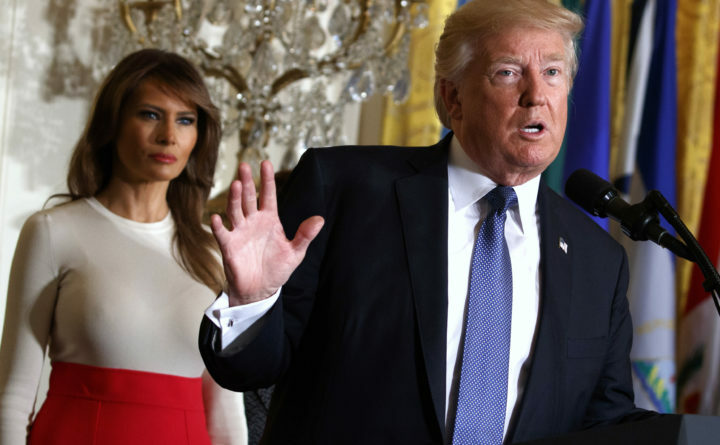 WASHINGTON — President Donald Trump vowed Monday to end the “scourge of drug addiction in America,” even as his administration continues to push significant cuts to health care assistance used to combat addiction. Although Trump once again spoke extensively about expanding the federal death penalty for drug dealers, his administration released a three-page list of proposals before his speech that ruled out any change to existing federal law, suggesting instead that the Justice Department would take a more aggressive stance toward those offenders already eligible to be put to death based on other capital offenses, such as drug-related murders. Trump’s proposal also included an initiative to cut prescriptions for opioids by one-third over the next three years. The proposal lacks details on federal spending, however. That, and the administration’s separate proposals for major cuts to Medicaid, the chief source of funds for people seeking treatment for drug addiction, is causing advocates to question the president’s commitment. “I’m not sure we can really call this a plan,” said Dr. Andrew Kolodny, co-director of Opioid Policy Research at the Heller School for Social Policy and Management at Brandeis University. Kolodny said the administration needs to make a long-term commitment to therapy, on the order of $6 billion a year for the next decade, so that people suffering from addiction can have immediate treatment options that will dissuade them from an easy $20 fix. Administration officials have shifted questions about funding to Congress, which has yet to coalesce on how to address the epidemic, much less how to pay for a plan. Congress has appropriated some additional money in recent years, including $6 billion over two years in the most recent spending bill. Yet public health advocates and others, including some Republican state officials, say the aid has been woefully inadequate. Kellyanne Conway, a Trump adviser who has been working on the issue, told reporters aboard Air Force One that Trump wants $13 billion. Trump’s pledge won qualified support from at least some Democrats. When congressional Republicans proposed a multiyear, $45 billion increase in opioid spending in their 2017 bill to roll back the Affordable Care Act, Ohio Gov. John Kasich, a Republican, dismissed the money as akin to “spitting in the ocean,” especially because the bill also would have cut Medicaid significantly. Kasich has been among the most aggressive governors in tackling the opioid crisis and opposing Medicaid cuts. On Monday, the president called to the stage the parents of a New Hampshire man — whom Trump called “a great, great boy” — who died of an overdose to discuss the pain of losing him. “We’re going to solve it with brains, we’re going to solve it with resolve and we’re going to solve it with toughness,” Trump pledged. But like other issues Trump has dubbed a priority, from the economy to infrastructure, his attention to the opioid crisis has often been overshadowed by his proclivity to lash out at perceived opponents and shake up his staff; those who have been let go include his first health secretary. In the midst of Monday’s speech, Trump headed off on several tangents — calling out Democrats over immigration issues, pledging to lower drug prices for non-narcotic prescription drugs and previewing a proposal to lift more hurdles for terminally ill patients to try experimental treatments. Several of the proposals in the White House opioid plan have been championed by anti-drug advocates for some time, including more resources for research into non-addictive pain therapies. Massachusetts Gov. Charlie Baker, a moderate Republican whose administration has developed one of the nation’s most comprehensive responses to the opioid crisis, said at the National Governors Association winter meeting last month that the federal government is uniquely positioned to help develop non-opioid alternatives. As states build databases to track opioid prescriptions and identify physicians and others who may be overprescribing medications, state officials say the federal government could help coordinate these efforts. Playing that role appears to be what the Trump administration is proposing. But the administration’s proposals to cut hundreds of billions of dollars in federal assistance to state Medicaid programs — made again in the White House’s fiscal year 2018 budget proposal — would threaten much of the progress that states have made in recent years to confront the opioid epidemic, according to state officials, physicians groups and public health advocates. The Medicaid expansion made possible by the 2010 Affordable Care Act has played a critical role in helping states on the front lines of the crisis — including New Hampshire and much of New England as well as Ohio, West Virginia and Kentucky — to build up systems to treat patients suffering from opioid addictions. Trump’s calls to increase law enforcement efforts have received much of the attention, but it’s unclear what specific changes he would make. In recent weeks he has most prominently called for executing drug traffickers. On Monday, he said he had spoken to leaders of unnamed countries who claimed to eliminate their drug problems through the death penalty. The proposal released late Sunday calls for a federal death penalty for drug traffickers — not street-level dealers — “where appropriate under current law.” The administration is seeking actual changes in other laws, however, by adding stiffer mandatory minimum sentences for more categories of drug traffickers. Many treatment advocates criticized the emphasis on law enforcement. “Locking people away for having a disease has not worked,” said Dr. Yngvild Olsen, an addiction medicine physician and medical director for an outpatient addiction treatment center in Baltimore. But John P. Walters, who served as “drug czar” under President George W. Bush, said enforcement and interdiction, particularly efforts aimed at high-level traffickers, are key to breaking up supply networks. “If you don’t stop that poison, you can’t stop that dying,” said Walters, chief operating officer of the Hudson Institute, a conservative think tank. Still, Walters agrees with other specialists that the Trump administration has been slow to tackle the problem. “They’ve had problems finding a real plan and strategy living up to the president’s statements,” he said.